The clubhouse page has been re-designed to make it easier to use and more intuitive: whether you're an experienced dmClub customer who is familiar with the clubhouse, or a new user who's just getting started, this dmNote will help you find your way around. Watch the video tour on the right for an introduction to the Clubhouse's main features. This section contains links to your dmAccount, which is an index of all the financial information related to your account. You can click on the links in this section to make a payment onto your account balance, check your invoices and receipts for past orders, or review any outstanding orders that need to be paid. This is a list of all of the virtual number services you currently have active with dmClub. This list also shows you the service type (eg. 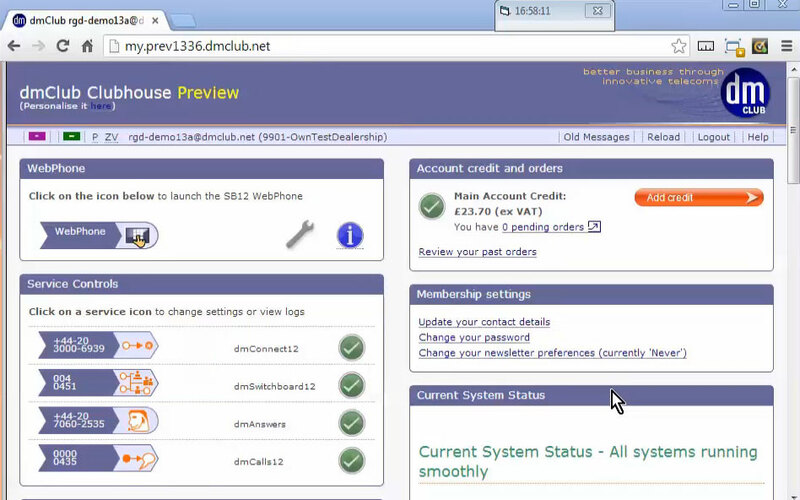 dmVoice, dmSwitchboard), and any number aliases you have set up. Clicking on each of your numbers will load the control panel for that number, where you can (for example) change your call forwarding settings or set up your voicemail email address. Here you can access the administrative settings for your clubhouse: update your contact details, change your logon password, and also change the preferences for receiving our newsletter. 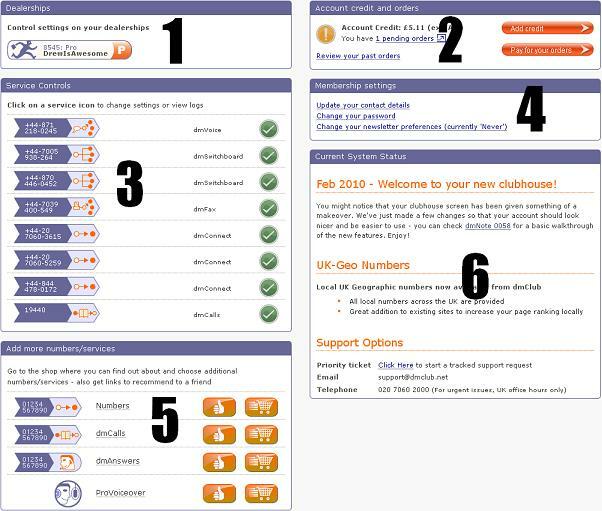 If you want to purchase additional dmClub services (for example add a dmAnswers live human answering service to your account, or buy a professional voiceover recording for your switchboard), you can access all the links you need in this area. This is where the dmclub support staff post notices about current technical problems or general system status updates. If you notice a problem on your number, it's usually worth checking this section before contacting support. Payments to dmClub can take up to 4 business hours to clear, so if you make a payment and it doesn't reflect straight away, don't panic! Feedback from dmClub users is very important to our design process. We hope that the main clubhouse screen will make it easy for you to use your dmClub services, but if you have any suggestions on how we could make things even better, then we'd love to hear from you. Please leave us a comment in the comment box below. I'm still confused, what do I do?